August book selection: Everything Happens For A Reason by Mira Kirshenbaum – Straight from NY to Paradise in a Day!!! On my journey to “living my best life now”, as said by Oprah, I am attempting to incorporate a monthly book selection into this blog. Please note that I said ATTEMPT. I will do my best, but not sure how long I can keep it going. My life changes quick, so please watch me for the changes. Lately, I have had the feeling that God has been telling me to go right, and I keep making that sharp left. Somehow going to left seems so much more exciting than going right, so I pick my way. Of course it never works out, it’s not the right way, it is a dead-end. As always God brings back to the start of the path, I don’t get lost , I don’t get in trouble. He allows me another chance to follow him, infinite chances to go right. I listened to God, and when he spoke, he brought me to a book, a book that will forever change the way I look at life. 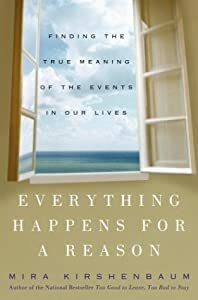 This month’s book selection is, Everything Happens for a Reason: Finding the true meaning of events in our lives, by Mira Kirshenbaum. While reflecting on past events in my life, changes that have been made, I once struggled to find meaning in them. I had a bad habit of feeling sorry for myself, hating the world that I was in, just hoping for something better that never came. I would wonder, why do certain things happen the way they do? Why do some events turn out bad, and why can’t things just go the way I want them to. I wanted perfection from life. Who am I kidding? Life doesn’t work that way. The odds are not always in my favor, and every event is not going to always have a happy ending. In life bad things happen. Bad things happen to everyone, the good that comes out of those bad events are the reason why they had to happen. Through her writing, Kirshenbaum points out that there are ten main reasons why these bad events take place in our lives. Through each chapter she thoroughly explains each of these ten reasons, she conveys real life examples from people to make sense of the true meaning as to why certain events may occur in life. Kirshenbaum is able to help the reader reflect on his or her own life events, and find a way to make that event fit into one of these reasons. This book opens the reader up to deep self-reflection, possibly gaining closure and moving forward from events that appear damaging to our lives. Kirshenbaum writes in a way that enhances a positive overtone for negative events. This book portrays the message that life does get better! People are resilient and if we are just able to bounce back, bounce back quick, and look for true meaning, our lives will be better than we have ever imagined. Kirshenbaum does an excellent job of making the reader feel at home within the book, and brings the message that life does not just happen to happen. Life really does happen for a reason. 10. To help you become a truly good person. My challenge to you is to sit and reflect on the negative events of your life, if you feel you know the reason why they happened, great! You are one step ahead. If not, if you continue to feel sad, wonder “what if”, or have trouble moving on think of the meaning behind this event. How has it changed you? Can anything positive come from this negative event? Look within your inner self for the reason, trust me it is there. If you have time read, Everything Happens For A Reason by, Mira Kirshenbaum. It sounds like this book is all about keeping a positive perspective and trying to take a negative experience and turn it around as a positive learning experience. Yup and also growing from that experience and moving on from it so you can see what life is trying to teach you. Life doesn’t happen by accident its all part of this weird cosmic plan to get us where we need to be.